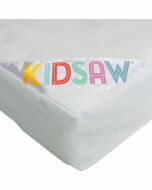 Kidsaw Natural Superior Coir Safety Mattress is made from coir wool which provides a natural and environmentally friendly mattress giving added comfort and excellent support. The bamboo cover provides a natural and environmentally friendly cover and has great benefits including: Anti-bacterial, anti-fungal, anti-dust mite, air permeable, reversible and wipe clean cover. 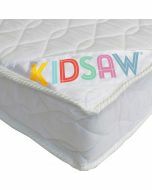 Kidsaw Natural Superior Coir Safety Mattress is made from coir wool which provides a natural and environmentally friendly mattress giving added comfort and excellent support. The bamboo cover provides a natural and environmentally friendly cover and has great benefits including: Anti-bacterial, anti-fungal, anti-dust mite, air permeable, reversible and wipe clean cover. 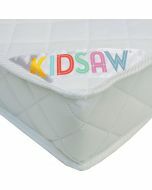 Always ensure a good close fit of the mattress in the cot or junior bed. The cover can easily be removed for washing by means of the zip. Size: (60 x 120cm) (23.6 x 47.2in). Complies with Government Regulations of Ignition, BS7177 2008 A1 2011 Construction complies to BS1877 Part 10 2011 A1 2012. Mattress Dimensions H.10 x W.60 x D.120cm.